Back in 1998 when we started Good Hemp, the world was a very different place. Google had just been founded, Europeans had just agreed on a single currency and Titanic was the big film of the year. We know, we’re old. It had also been 10 years since a Nasa scientist had declared that “global warming had begun” and we couldn’t believe more people weren’t using hemp. Our founders Henry and Glyn had just started growing the stuff on their farm in Devon because it was such a sustainable crop. It had the ability to breathe in CO2 (4x the amount than trees! ), returned nutrients to the soil, and could water itself with no need for nasty pesticides or herbicides to grow. When they discovered it also had an unbelievably nutritious seed – naturally packed with omegas, plant protein and fibre – there was no looking back. We thought, and still do, that this was a miracle plant. Our mission was simple: make hemp a kitchen staple around the world. So our team of food specialists and scientists set out to create a range of incredible foods – from cold-pressed hemp oil and hemp seeds to plant-based milk and hemp protein. We believed that if we quietly went about growing a small community of natural advocates (that’s you), we would eventually spread the word far and wide. Cut to 2019 and the UN says we’re 12 years away from climate change catastrophe. Meat and dairy are outpacing the fossil fuel industry to become the world’s biggest contributors to climate change and school kids are protesting because our government isn’t taking enough action for the planet. In short, change is needed pretty urgently and we need to shout louder. So our mission is now to replace bad with good. That means no more animal emissions, deforestation or water wastage. No more unhealthy, processed foods. And no more bad substitutes – if you’re going to make the change from dairy why not switch to the alternative that does the most good (that’s us btw). The good news is that there are a growing number of people who are taking climate change seriously. People are wising up to the fact that just because something is healthy for you, doesn’t mean it’s healthy for the planet (sorry soya) and natural doesn’t mean no-impact (you too almond). Already 1 in 5 people order plant milk in their coffee and 1 in 4 households eat plant-based foods. We want to celebrate the big changes and the small – switching your almond milk to hemp or embracing #meatfreemondays is a small step in the right direction. But we knew if we wanted to get everyone on board with hemp, we needed to make some changes too. So we’ve got new products – a creamy seed milk and a frothable barista blend – with healthier recipes and natural ingredients. New packaging, which helps us have a conversation over breakfast without even picking up your phone (but you should follow us on instagram too). You’ll hear us shouting “Nothing Changes if Nobody Changes” far and wide. Nope, there’s no more unsweetened and original. Just our creamy milk – perfect for pouring over cereal, porridge or splashing in tea. Our founder Henry has been working tirelessly over the past year to create the most natural hemp milk recipe with the fewest ingredients possible. The result is our new creamy milk made from a hemp seed base, water, and a natural gellan gum (which keeps everything bound together and is plant-based and sustainable). We’ve also found a new process which makes the hemp milk taste fuller and creamier than ever. It’s still packed with all the good stuff – 1 glass of Good Hemp has 2x more omega 3 than a tuna steak – in fact, it’s one of the best plant-based sources of omega 3 there is. 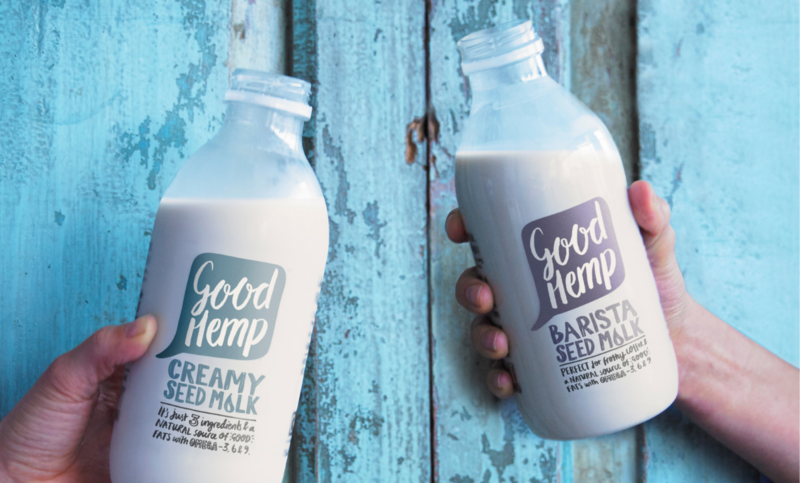 When we tried to get baristas using our hemp milk they weren’t convinced. And rightly so. No one could make latte art with our old product. So we collaborated with a coffee specialist to develop a new frothable version of our milk which worked with the highest quality espresso. Everything in this drink is plant-based and sustainable, but it has more ingredients than the creamy milk to be able to froth to perfection. It will meet the expectations of your professional barista to your most difficult house guest. (PS: Anyone who can make hemp leaf latte art – hit us up hello@goodhemp.com). The bad news is that we haven’t solved the plastic issue (and if we had, we probably would have no time to write this blog post because we’d be speaking at the UN in New York.) It’s not as simple as using hemp bioplastic or glass. Currently there are no bioplastics available on the market for our product, and glass means a higher eco-cost due to transport. Plastic bottles are the easiest to recycle, as many councils don’t separate the plastic and paper used in Tetra, but we use that too. In short, we haven’t solved it. But we’re searching for ways almost every day to reduce our impact in this way and keep up with the volume we need for hemp to have an impact.